Vizcaya VXOP rum, the ultimate sipping rum, is crafted using time-honored, traditional methods that date back to nineteenth century Cuba. Since the climate and terroir of the Caribbean are uniquely suited to producing superior sugar cane crops, this area has a proud heritage of rum distillation. 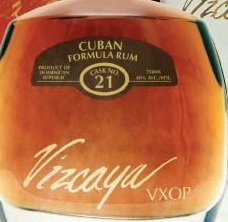 Now you can taste the rich history of rum with Vizcaya VXOP Cask 21. Made in the Dominican Republic, Vizcaya VXOP starts with sugar cane harvested at the peak of freshness, then quickly pressed to collect its fragrant juice. The juice is fermented and distilled in small batches, before being aged in selected oak barrels that formerly held bourbon. This process, known as methode agricole is the unique distilling method that infuses Vizcaya VXOP rum with its exquisite bouquet, smoothness, and delicately refined taste. When you see the rich, golden color of Vizcaya and allow its complex flavors fill your senses, you'll understand why the master rum maker holds each stage of the process to the highest possible standards. Sipping Vizcaya VXOP, on the rocks or just by itself, is an experience that mirrors the relaxed, inviting rhythms of life in the tropics. With its delicately nuanced spice and notes of buttery sweetness, this sophisticated sipping rum will transport you to a time when spirits were made with care, in small batches, and from the earth's finest ingredients. Premium sugar cane, distilling processes that have stood the test of time, and proud craftsmanship all collaborate to create the distinctive qualities of Vizcaya VXOP Cask 21 rum.An award-winning rum with a rich heritage of craftsmanship, Vizcaya VXOP is one of the world's finest sipping rums. It is distilled in small batches according to time-honored rum making methods in which the fragrant juice extracted from pure sugar cane is fermented and aged in select oak barrels. It is this extensive aging which culminates in Vizcaya's warm, mahogany color and buttery palate. With its refined notes of spice, butterscotch, honey and caramel, Vizcaya VXOP may be best appreciated when served neat or on the rocks, although it can also be enjoyed as part of a very special cocktail. Each element that goes into the making of Vizcaya VXOP--from the soil where the sugar cane grows, to the sensuous shape of the bottle that holds the finished nectar--is intended to enrich the aficionado's experience of relaxing with a glass of this singular spirit. The velvety bouquet of Vizcaya VXOP hints at its warm, smoky spice. Notes of cinnamon, vanilla, clove and ginger are followed by a whisper of tropical fruit. The first taste brings a voluptuous but balanced sweetness, reminiscent of maple and butterscotch. Vizcaya's smooth finish integrates all of these elements into a sensory, satisfying harmony.